USD/CAD is unchanged in the Wednesday session. Currently, the pair is trading at 1.3243, up 0.05% on the day. On the release front, there are no Canadian events until Thursday. In the U.S., the markets are expecting soft numbers from consumer inflation. CPI and Core CPI are forecast to post gains of 0.1% and 0.2%, respectively. On Thursday, the U.S. publishes retail sales and PPI. 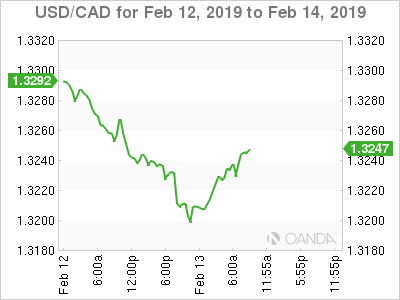 The Canadian dollar is sensitive to the mood of investors, and positive news on Tuesday could bode well for the currency. In the U.S., lawmakers have tentatively agreed on a proposal which will avert another government shutdown, which would take effect on Friday. However, the deal needs to be approved by Congress and President Trump. The agreement does not provide Trump will funding for a border wall, and the deadlock between Congress and Trump over this issue triggered a government shutdown in January which lasted 35 days. Both sides are eager to avoid blame for a second shutdown, and Trump hinted earlier in the week that he would go along with the deal, albeit with reservations. Taking a page out of the Federal Reserve’s playbook, the Bank of Canada has become more dovish, after raising rates three times in 2018. The BoC is expected to stay on the sidelines at its next policy meeting in March 6. The Canadian economy is being hampered by the global trade war, which has reduced the demand for Canadian exports. Weak oil prices have also weighed on the economy and kept inflation at low levels. The Canadian dollar is under pressure, and has lost close to 1.0% in February.